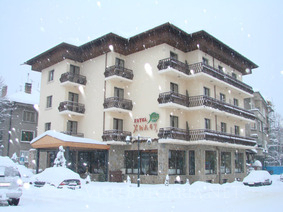 Hilez Hotel in Tryavna, Bulgaria. Bookings and accommodation. Location: Hilez Hotel is situated in the central part of the town of Tryavna, central Bulgaria, very close to the towns of Gabrovo, Dryanovo and Veliko Tarnovo. Hotel Accommodation: It offers 24 double rooms, 13 of which have additional beds, and 9 have a kind size bed. All the rooms are furnished according to the latest interior design trends and come with en-suite bathrooms, satellite TV, internet, telephone, air conditioning and central heating. A safe to keep valuable objects is available at the reception desk. Wine & Dine offers a lobby bar with a variety of drinks and cocktails, and a tavern that offers traditional Bulgarian dishes and can seat 80 people. The tavern in the Hilez hotel can seat 80 people and offers a great number of high - quality brandy and wine. The menu represents the traditional Bulgarian cuisine. We will be pleased to arrange your family parties – weddings, birthdays, anniversaries.